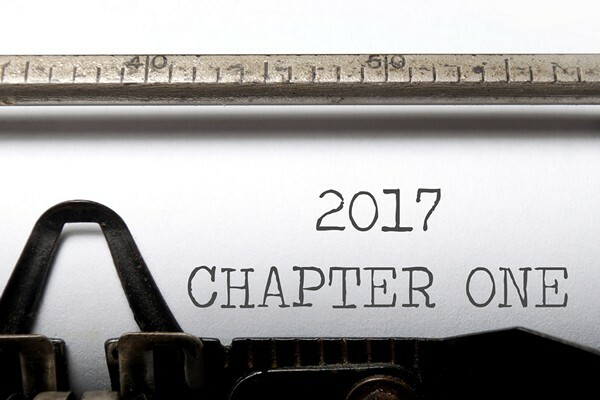 The Accidental Locavore has been inundated with emails predicting food trends for 2017. My gift to you is that this isn’t a slide show (you can thank me in the comments). Use all food! Food waste is a huge issue and you’re going to hear a lot about it this year. Buy what you’re going to use. Use it. 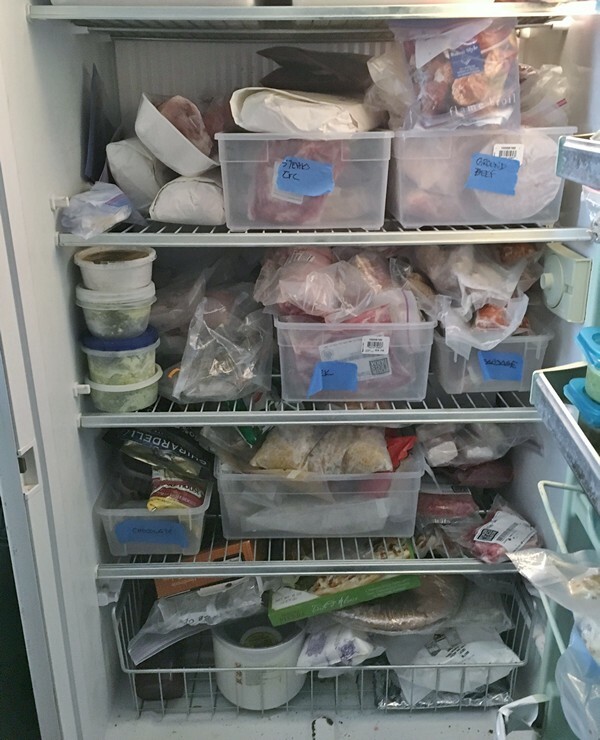 Shop your freezer, fridge, cupboards, pantry. You’ll be surprised how much you can make without ever leaving the house. I made 23 dinners with just the stuff in my freezer. Bowls-grain, rice, porridge, poke. Put a bunch of vegetables, a carb and a protein in a bowl and you’re trendy. 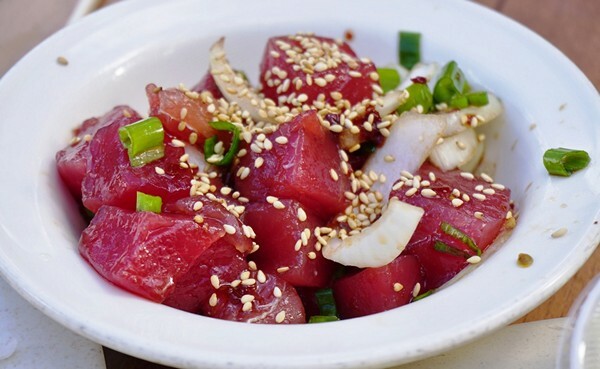 Extra points for poké (pronounced po-kay). A good way to use up small bits of things in your fridge. Hey if you haven’t given up kale yet, you could be a newbie to cauliflower. 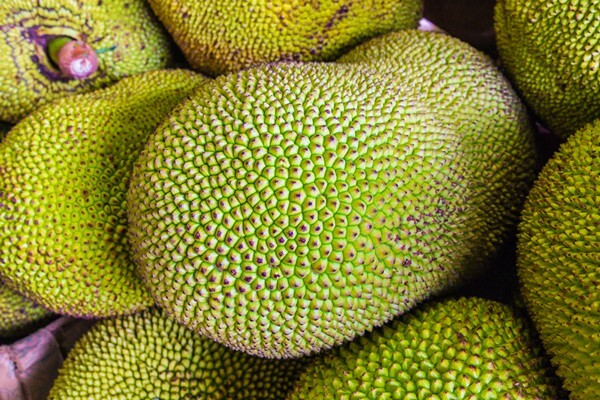 Or if you really want to be cutting edge, skip down to jackfruit below. Or maybe it’s the Instapot. Fermented foods (from any number of sources). Imagine if everyone in your building started fermenting stuff. Click here for unscented Febreze. Whey (to get this you have to make something else, like Greek yogurt) and then figure out what to do with it. I’ve marinated chicken in it—ho hum. Empanadas, dumplings etc. All good but labor intensive and someone in a restaurant near you does it better. Octopus – got a rock to pound it on? Didn’t think so. Fry bread. Ditto. Have you ever actually eaten the stuff? Think flattened, fried zeppole and you’re pretty much there. Going to go out on a politically incorrect limb here, but the Native Americans have not given us much to work with food-wise. Indian Pudding and frybread are two prime examples. 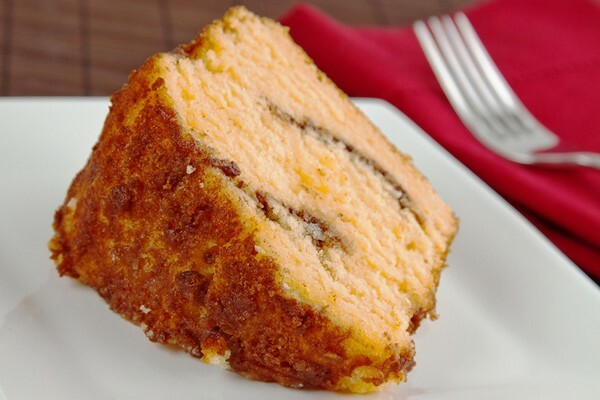 Coffeecake – oh, excuse me, breakfast cake. I’ve had my friend Alan’s mother’s coffeecake recipe on my mind lately. Time for breakfast comfort food? What do you think? Any food trends you’d like to add, or see the last of? Overplayed already? My friend Rob, had this recipe on his Facebook feed and the Accidental Locavore thought it looked great. It came from a new cookbook, Made in India, which I promptly added to my bookshelf (floor actually) and am glad I did (even though I always swear, no more cookbooks, it was justified by donating a bunch to the local library). This serves 4, but you can scale it up or down depending on the size of your cauliflower. Preheat the oven to 350°. Line two sheet pans with aluminum foil (or parchment paper) and set aside. Wash the cauliflower and pull off the leaves. Break the cauliflower into small florets and set aside. Steam the cauliflower in a pot of boiling water and blanch for a minute or microwave for about 2-3 minutes. Drain it really well and let it dry for about 5 minutes. Using a mortar and pestle, grind the cumin seeds with the salt then add the chile powder and turmeric, followed by the oil. If you don’t have a mortar and pestle, you can run the cumin and salt through a spice (coffee) grinder and put it in a small bowl with the chile powder, turmeric and oil. Mix well. Put the cauliflower on the sheet pans in one layer and drizzle the oil over it. Toss to make sure the cauliflower is well coated. Roast in the oven for about 30 minutes, shaking the pans every 10 minutes to ensure it browns evenly. Put cooked cauliflower in a bowl or platter and squeeze the lemon over it. Serve and enjoy! My verdict: This is going to be has become one of my go-to dishes! Delicious, simple and easily tweaked. Since I was making Mexican spare ribs, I used lime instead of lemon to give it more of a Mexican flavor and they were perfect together. I steamed the cauliflower in the microwave—it’s faster and rather than getting oil in my mortar and pestle, ground and mixed the spices, then put them in a measuring cup and added the oil. 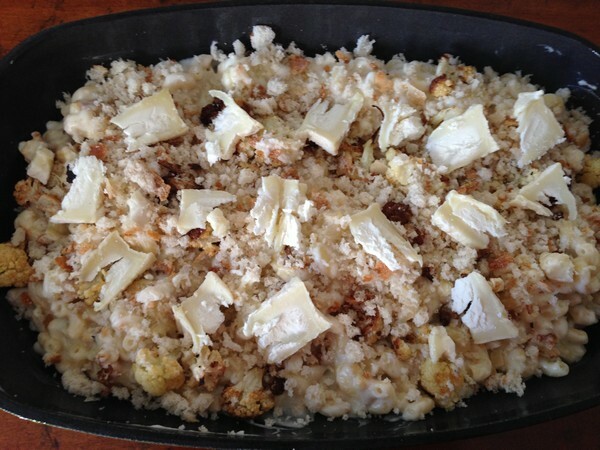 That made it easier to drizzle over the cauliflower before roasting. 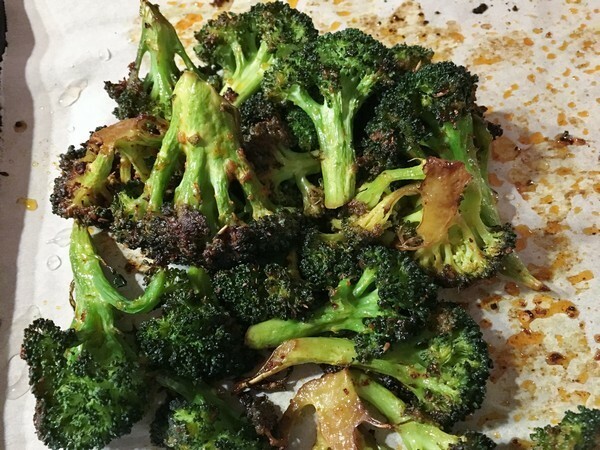 Since I wrote this I’ve done broccoli the same way, this time with lemon (and I let the steamed broccoli marinate for a few hours in the oil) and it was great! As you know, cauliflower is poised to take over for kale as the next over-played vegetable. 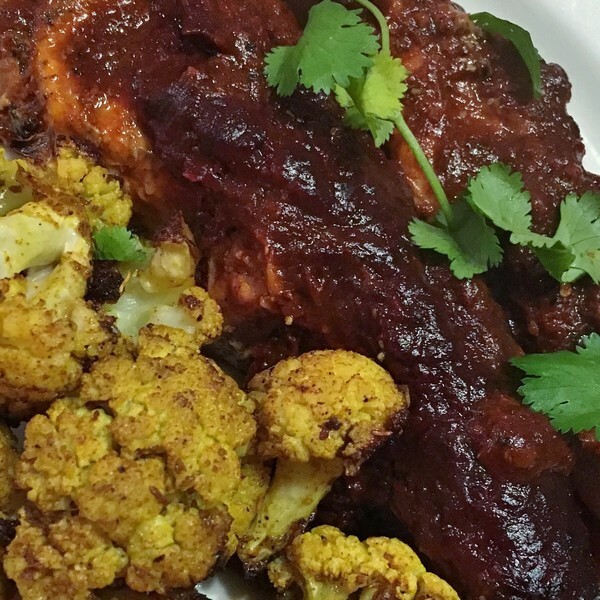 Being trendy enough, the Accidental Locavore found this recipe for roasted cauliflower with a “Buffalo” sauce. It’s easy and you can roast the cauliflower ahead of time. Serves 2-4, depending on the size of the cauliflower (and the hunger of your audience). Preheat the oven to 450°. 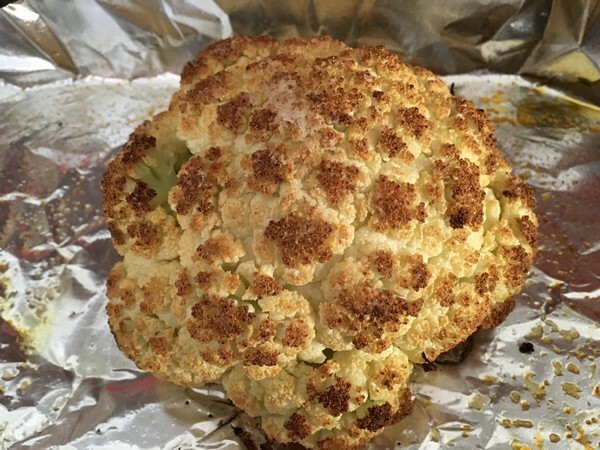 Place the cauliflower, stem-side down, onto a foil-lined baking sheet. Drizzle with the oil and sprinkle with the salt. Roast until tender and browned on top, 30 to 35 minutes. Let cool for 5 to 10 minutes. When cool enough to handle, trim the florets into 3-inch-long pieces (about the size of chicken wings) and cut the stem into thin slices. In a large saucepan, combine the Sriracha, Frank’s RedHot sauce and the cauliflower, and toss to coat. Place over medium-high heat, and when the sauce begins to sizzle, add the butter. 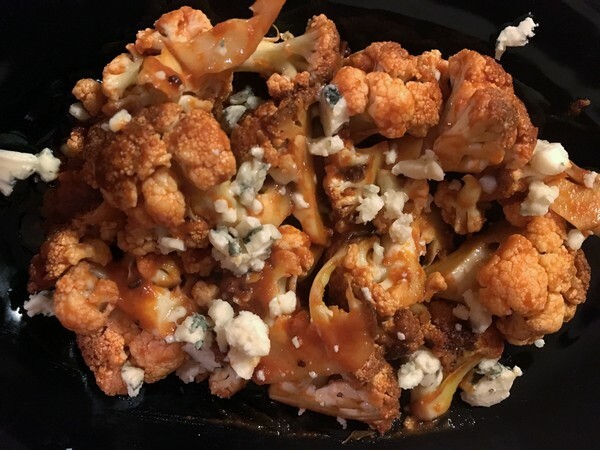 Cook, tossing and stirring often, until the sauce is slightly creamy and the cauliflower is heated through, 3 to 5 minutes. Sprinkle with the blue cheese, serve and enjoy! My verdict: Provided you like Buffalo sauce, this could make a cauliflower lover out of the skeptics out there! It’s really easy, especially if you roast the cauliflower ahead of time, like I did, then you can just pull it out and finish it off. I thought it was maybe a little too spicy and will cut down the Sriracha to 2 tablespoons and add more 2 more tablespoons of Frank’s the next time I make it. Since I had some real Roquefort on hand, that was my blue cheese, which was great, but you certainly will get a fine result with any good blue cheese. Serve it as a snack or side dish. 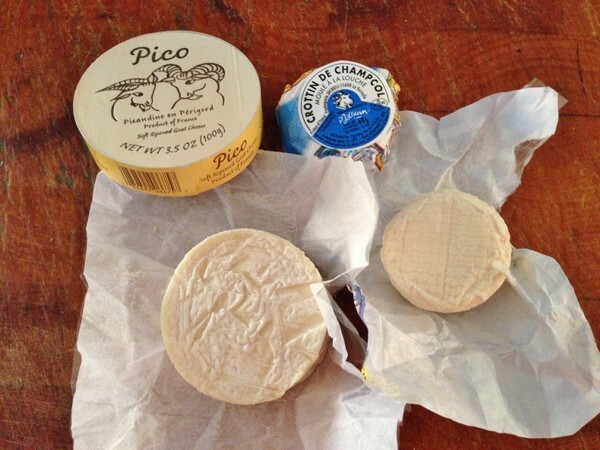 Finally in receipt of my chèvre, courtesy of Goat Cheeses of France, the tangy Pico and some classic Crottin de Champcol, the Accidental Locavore needed to come up with a good recipe for them. Normally this just would have been some fun time in the kitchen with a good dinner as the result but since these both were fairly strong, specific chèvres, it took some time to figure out how best to showcase them. Preheat the oven to 400°. 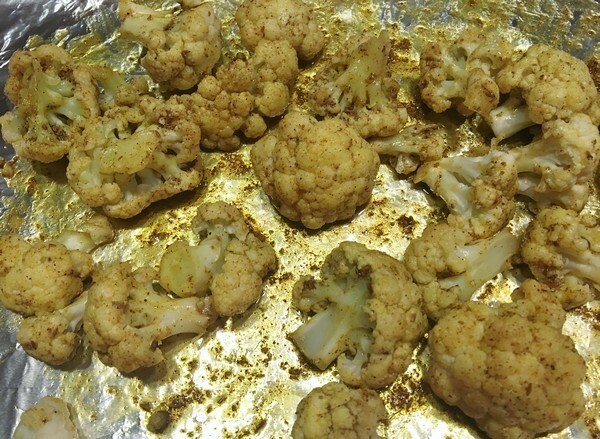 In a large bowl, toss the cauliflower with the olive oil, salt and pepper until well coated. Roast on a baking sheet for 25-30 minutes, turning after 15 minutes, until nicely browned. Remove from oven and set aside. If you’re going to cook the mac and cheese right away, turn the oven down to 350°. While the cauliflower is cooking, bring a large pot of well-salted water to a boil and cook the elbow macaroni for about 10-12 minutes, until al dente. Drain and set aside. Heat the milk in a medium-sized pot until warm, but not bubbling, about 4 minutes. Remove from heat. In a large, heavy pot, melt the butter over medium heat. When it’s melted, add the flour and whisk constantly until the mixture turns light brown, about 3 minutes. Turn the heat down to very low. Slowly pour in the warm milk, about 1 cup at a time, whisking constantly. It will get very thick and gradually thin out when all the milk has been added. Once all the milk has been added, raise the heat to medium and keep whisking. After about 3 minutes, the sauce should thicken again. If it coats a spoon, you’re good! Stir in the nutmeg, salt and pepper. Start adding the cheese, stirring until it’s melted. When all the cheese has been incorporated, taste and adjust the seasonings. Remove the pot from the heat and add in the cooked elbow macaroni. Stir to combine. Add the roasted cauliflower and toss until evenly coated. With the butter, lightly grease a large gratin pan. Add the mac and cheese mixture. Sprinkle with the breadcrumbs and then dot the top with the wedges of Pico. Bake in a 350° oven for 30 minutes until browned. Serve and enjoy! 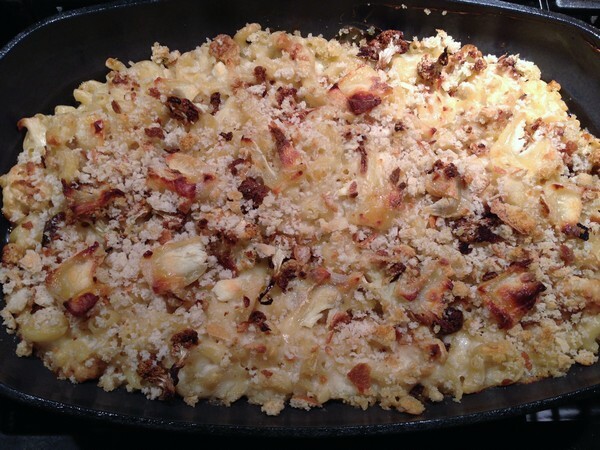 My verdict: A winner– this is mac & cheese for adults! Frank said I could make it anytime, his highest praise! The sauce would be wonderful as a gratin with potatoes, or just the cauliflower on its own. I served it with some lightly-dressed arugula, to cut the richness of the dish. If you should be lucky enough to have a fridge full of chèvre, give it a shot! 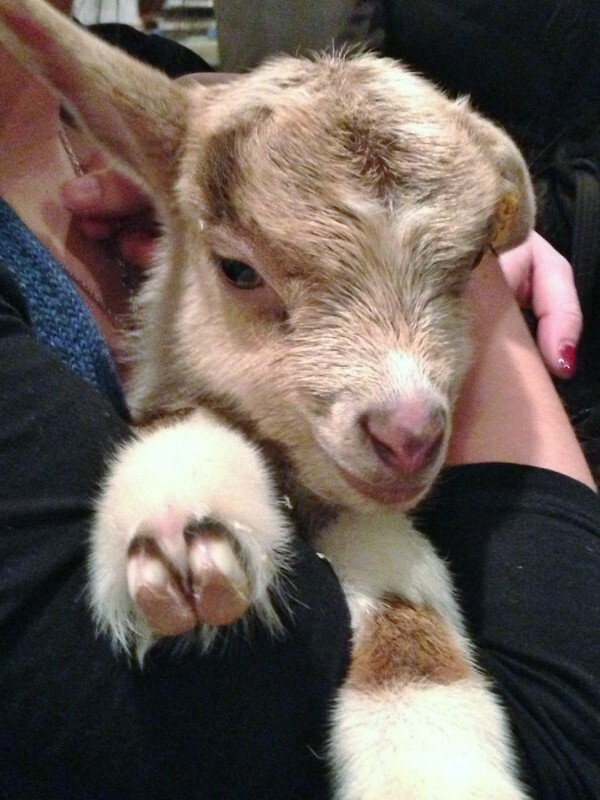 Don’t forget: Leave a comment or share the post on Facebook and win a box of 5 French goat cheeses (exact cheeses to come) “so they can test, taste and create their own recipes. They will also receive a package with our tried and true recipes for inspiration, trivia cards on the cheeses so they can learn a little bit of history on French goat cheeses and temporary tattoos to show their Original Chèvre love. ” The winner will be picked on September 30th.